This weekend several friends came down for the weekend, the original plan was poker then DnD, instead we played lots of board games, and then eventually got around to the DnD today. First up was my second game of Caylus, and again I enjoyed it. I played with Dave, Wilka and The Wife, of which only The Wife had played before. Now that I knew how to play, the rules were simpler to explain than reading them, so we got moving fairly quickly. I only built one building all the way through this game, which was probably my undoing, I did best on building the castle though, and very well on favours too. I tried to build on the turns when I could definitely build first or build the most. Often this worked, however, I was rarely first in the order of play, and as I result I often lost out on the two or three resource production buildings. Again, we built none of the blue prestige buildings, we didn't even build any of the green residental buildings. However, there was a lot more of using the provost to shaft people - in fact Dave got down to that in the very first turn :-) The game ended when I filled the Towers section of the castle. Due to the continual use of the provost for shafting, the provost often ended behind the bailiff, so the bailiff moved forward pretty slowly. Dave won the game, helped by a healthy stash of gold resource cubes, I finished joint second with The Wife about 4 or 5 places behind. We then played a couple of games of Border Reivers without The Wife. In the first one Dave left himself wide open, while Wilka holed up defensively. Spotting an opening, I went for Dave, quickly beating him in his castle, then sacking his city, followed by converting his last town. With Dave annihilated, I controlled the mine and two thirds of the board. I quickly started stockpiling cash (I'd not spent much on re-inforcements) and Wilka realising I would beat him to the cash total started moving towards me. However, Wilka had fortified fairly fair back, and the map was pretty slow due to the location of the forests, and got the cash before Wilka could reach me. Then Dave played Insurrection successfully stealing some money - enough to stop Wilka winning the game and get him to the winning mark. Due to his thorough fortification of his borders neither Wilka nor I could reach him in time. So Dave took the crown. I stumbled across another great thread on BGG by Tom Vasel of The Dice Tower fame. 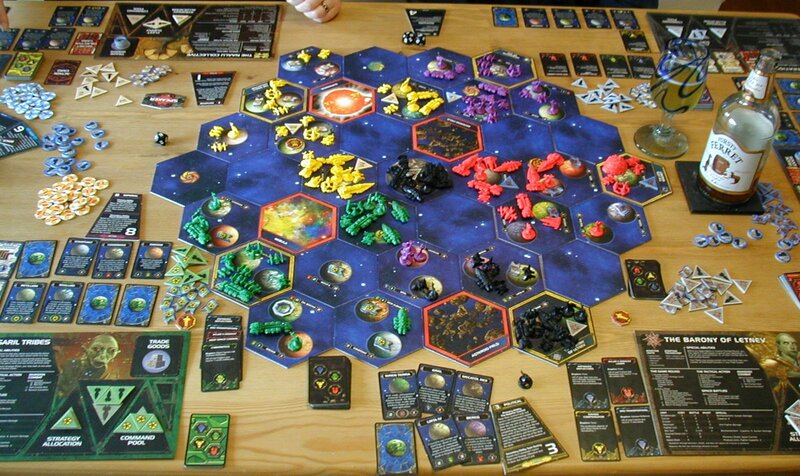 This thread is the second part of Tom's collected wisdom on board games design. Tom's been around the block asking an impressive list of game designers, publishers and reviewers for their advice to aspiring designers. The results are definitely worth a read, they'll repay the time spent reading them many times over. The first part of the advice is available on The Dice Tower's website. I read on a thread on BGG that Dutch games publisher Splotter are doing another print run of Antiquity. Antiquity has got some very good reviews both on BGG and from Mikko Saari on his gameblog. When I first read Mikko's review I was very tempted to buy a copy, but the fact that it was out of print and would cost me a small fortune to get a second-hand copy on eBay put me off. Now it's definitely on my wishlist. Last night we had some friends round for games. After a brief discussion we decided to try out Caylus, and settled down to a 5-player game. First impressions? The rules make it seem incredibly complicated. I'd not read them before, and I was reading them out aloud to the others and we were all completely confused. Once the game got underway it was actually fairly straightforward, but the rules made it feel bewildering. Halfway throught the first turn someone dropped out so we ended up playing a 4-player game. There were a whole bunch of parts of the game we hardly used, no-one used the Provost to stop other players performing actions (although some people tried the Provost was always moved back to allow them to perform their action); there was no discussion around the Provost moves; no-one built a blue prestige building and we weren't sure which buildings to build to gain points most effectively when someone else placed a worker in them. In the final turn I thought I stood a pretty good chance of winning, but The Wife pulled a rabbit out of a hat and managed to deliver three batches, and then Roman and Jochen delivered two, leaving me with only one space available. The Wife promptly won, with me trailing her by the three points I could have got had she not outmaneouvred me in the package delivery. First up - last weekend. In addition to the copious games of Border Reivers mentioned in a previous post The Wife, Mal and I had a game of Puerto Rico on Saturday night. It was my first 3-player game of Puerto Rico, and I was impressed by the speed of the game - it seemed to go much quicker than the 4- and 5-player games. Mal hadn't played before, so we talked him through his options as the game went along - he was up and running very quickly, as is pretty much expected with Eurogames - they look and sound complicated until you start playing at which point you realise the play is straightforward - it's just finding a winning strategy that's hard. Mal made use of his Hacienda to build up an impressive range of plantations, and made good use of it, getting several early shipments off to the Old World. The Wife and I got the Construction Hut and proceeded to stock up on quarries, so in the early stages we had very few goods to trade or ship. One difference we spotted was more available wealth in the 3-player game (possibly due to the ratio of role cards getting doubleloons to players which is 1:1 for a 3-player game). As a result we all got one of the large buildings. The game ended when I filled all of my building slots, and in the final count Mal's judicious use of the Hacienda and Captain paid off as he won the game by a healthy margin. Monday's games with Richard consisted of two games of Carcassonne, followed by a game of Border Reivers. It was Richard's first game of either, but as usual Carcassonne proved a very entertaining and easy to learn game. I won the first game as Richard had not spotted a large area I had managed to farm on my own, however, Richard struck back winning the second game by a healthy margin after he managed to join a massive city of mine to a tiny city of his while simultaneously completing them both. Nice. We finished off with a game of Border Reivers, and yet again I was beaten at my own game. As I've said before combat is Border Reivers is brutal - if you go into a fair fight you're both likely to lose lots of armies. Richard played fairly aggressively, made good use of the cards (he had 4 at one point - that scared me) and often went into fair fights. Somehow, feeling on the back foot he got me attacking him back in fair fights, rather than waiting for backup or manoeuvring an advantage. It cost me, I lost a few fights and the Richard could wipe me out at the end. Still, I enjoyed it - there was a bit of back-and-forth over the mine and some interesting use of cards too. Mal's down for the weekend, and the first order of play was some Border Reivers. Mal has played the game more than anyone but me, we had a series of games over several weeks in 2004 where we must have played nearly 20 games against each other - he knows the mechanics very well, and knows when to use the subterfuge cards to cause the most carnage. I was keeping an eye on the length of the games to check that the time estimates I have are realistic, and I was also interested to know whether the game was usually won by one of the two mechanisms (by collecting cash or by annihilating your opponents). We played four games over the afternoon, ranging between 20 and 45 minutes in length. Mal and I each won two and we each won one by accumulating cash, and one by annihilation :-). I think I was most pleased with the variety of the games, we laid out 4 very different boards, and the resulting play was very different as we choose new strategies to capitalise on the board layout and the unexpected ploys of our opponents. We had some great battles to control the mine, and yet in other games the mine was hardly used. In some games the really nasty 'Insurrection' card came out, in others we used less aggressive cards like 'Reiving Party' to lure our opponents into the jaws of a trap. The card that got the most usage was the 'Market' which we agreed (and Mal had spotted ages ago!) trumped the 'Military Academy' and 'Guildhouses' cards. With that in mind, we discussed some new rules for the 'Military Academy' and 'Guildhouses' which makes them a more attractive proposition, I'll need to play test those new rules soon, but conceptually they sound like a winner - bringing some interesting new decisions to the reinforcements phase. Yesterday I had the day off work to wait in for a bloke to come and fix a bunch of things in the flat. I took advantage of this time off to concentrate on getting some stuff sorted out for Border Reivers, and had a very successful day. First up was a phone call to a printer to explore ways to reduce his estimate for the various printed parts of Border Reivers. This generated some useful ideas, and a new request for a quote with different specifications. Secondly I did some work on the second attempt at the tiles design, making some decent progress and fixing a bug in the computer program I've written to generate the overlaid details on the tiles. Finally, I went into town to do a bunch of chores and popped into my FLGS Travelling Man. I thought I recognised the guy behind the counter as the Managing Director of the chain who I had spoken to on a previous visit, and I was right. I chatted to him for a good while and managed to get a huge amount of really useful information about distributors and how best to approach selling the games in shops. He also said that they will buy directly from publishers, which was great to know. 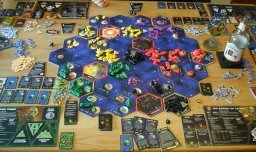 Here's the last post describing last weekend's gaming. It was Tim, Vicky and Dunk's first game of Puerto Rico, whereas The Wife and I had played it a few times recently. Things got off to a fairly brisk start with the Haciendas, Construction Huts and Hospices disappearing quickly as in the previous games we had played. Having been completely short of cash in previous games I made use of the Prospector early on to ensure I had money to build. Being near the end of the order of play for the first round I had only the Hacienda available, so I ended up throughout the game with loads of plantations (far more than I could occupy). I was determined to get the Residence to take advantage of my many plantations, but The Wife beat me to it, so I had to settle for the Customs House. That turned out ok for me in the end as Dunk accidently gifted me a shed load of VPs in the final turn :-). I was keen to get the Factory this game, but in the end I went for the Customs House instead, which was a much better call. Dunk got the Harbour (it's first ever outing for our set) and that is a very scary building to see in another player's hands. I won it in the end by a 4 point margin with 49 points thanks to Dunk's Captain miscalculation. After that Tim and I had a quick (only 20 minutes!) game of Border Reivers. Tim hadn't played it in ages, and suffered really bad luck on his reinforcement rolls, whereas I got a free reinforcement in the first turn. I managed to secure the mine, and build a second city, raking in a high income. Tim opted for 3 towns instead of the city and then attacked the mine with one of his remaining armies, and an 'Ambush' card. Combat is brutal in Border Reivers, especially when you're evenly matched so we both lost our armies. Spotting a weakness (Tim didn't have any reserves defending his land) I managed to romp through and butcher him in fairly short order. The game wasn't much fun for Tim, he felt pretty outnumbered due to the reinforcement rolls going in my favour. In his place, I would have attacked the mine with greater numbers instead of settling the towns, and ensured I had some defences in fortifications behind the front line just in case I lost the battle. Saturday morning began with a debate over what to play (okay, it actually started with a fry-up) Tim wanted to play Puerto Rico at some point and was keen to play Twiglet, Dunk favoured Settlers fearing Twiglet would take over the weekend. We eventually decided to go with Twiglet, which was brave as the only two previous 5-player games we had played had both lasted over 10 hours! I thought that seeing as we had all played it once before (even if it was ages ago for some of us) the game would be quicker, and fortunately I was right. It only took 5:15, literally half the length of the last game we played together as a group. We played the Distant Suns expansion again, which I'm loving, and had a nice, fairly balanced game. The Wife got off to a swift start playing the Imperial strategy a couple of times and edging out into the lead, after that we generally took it before she had a chance, so we slowly started to catch up. Most of us managed to claim one or two of the public objectives so we were all around 3-5 VPs with The Wife out ahead on six or seven. Dunk was the aggressive race again (which suits his playing style well), and he had a run in with Tim fairly early on, which forced Tim to tool his area up to the nines with PDSs, scaring Dunk off. I've never been one for buying PDSs, but after the impression Tim's 6 PDSs had on Dunk (who had a fair armada featuring two Dreadnaughts) I'm coming around to them. The Wife and I and later Vicky and I had a little spat but generally nothing too vicious. Here's a snapshot of the game in progress. As usual click on the picture for a full-size view. Friday evening, after our guests arrived, we had a bite to eat and caught up, we settled down to a couple of games of Carcassonne. We just played vanilla Carcassonne with the River Expansion (that comes in the box). I don't know what it is about Carcassonne, I can hold my own when playing 2-3 player games (which is what I play most of), but as soon as it comes to a 4 or 5 player game I seem to lose the plot when it comes to farming. Sure, farming is harder with that many players all fighting for a piece of grassland but still, you'd think I could adapt. Still, the games were fun as ever, and until the farming was totted up at the end I was definitely in the running (plus I got the immense pleasure of getting the monastery with road which fitted perfectly into a hole in the map for a very gratifying instant 9 points :-) ). Carcassonne with its simple mechanics and very short play time is a great starter or closer to a gaming session, or a filler while waiting for another game to finish. It's definitely worth that 9 rating I gave it on BBG. Even the randomness of the tile-drawing doesn't bother me - I like that you have to pit yourself against your opponents while dealing with the hand your dealt - there's enough tiles that you're unlikely to suffer really bad luck throughout a whole game. This weekend we've got some friends coming up from down South, and there will be plenty of drinking and gaming :-). I'll post some game reviews/session reports once the alcohol-haze has cleared. In other news, I'm probably going to go to The Cast Are Dice in Stoke in August, so if you're going I'll see you there. After speaking to a bunch of printers while investigating the cost of getting the various Border Reivers parts made I've found out that the work I've done on the tiles is at the wrong resolution so I've had to start again. The good news is I've worked out how to do more of it automatically, so I'm writing a computer program to do a lot of the hard work for me. In other news the pricing on the limited edition is progressing nicely and the first few pre-orders are starting to come in, despite the fact that I haven't really started advertising it yet, and I don't even know how much it'll cost. Right, I'm off to bed in a mo, but first of all, welcome to HamsterOfFury a new member and fellow board game designer who joined the blog today - I'm looking forward to his posts about his experiences designing games. I've had some time this evening to do some more work on Dollyo, my second game. It's still very much in it's infancy, but a game is starting to take shape. At this stage in the game's development I'm playing 2-player games against myself to try and balance the early stages of play. I'm only using a couple of the game's mechanics - I'll build things up once the stuff I'm currently testing becomes a bit more stable. It's changed a lot during the last couple of weeks, tonight though, the concepts stayed the same - it was just the balancing factors (exchange rates, etc.) that were varying. One of my aims with Dollyo is to make a game for 2-7 players, since Border Reivers is only 2-4. Once the game settles down a bit I'll need to start play-testing games with more players to ensure the balance doesn't go out the window as the game scales up. I've also been investigating printers for the limited edition run of Border Reivers. I'm expecting to do the printing myself (I'm buying an A3 colour printer soon), but if I can get a reasonable price for a small print run from a professional printer I might well go down that route. The problem with small print runs is that you don't get any of the buying in bulk discounts so it ends up being quite expensive to make and hence you need to ask a fairly steep price for it. I've become addicted to BoardGameGeek. I'm checking it frequently, posting on random forums, looking up every new game I hear about. This afternoon I'm hoping to get to my local games club: Beyond Monopoly. All being well, I'll get to play a load of new games and then post a session report this evening or tomorrow.